“Gabriel’s Redemption” a Great Sci-Fi Techno-Thriller….. 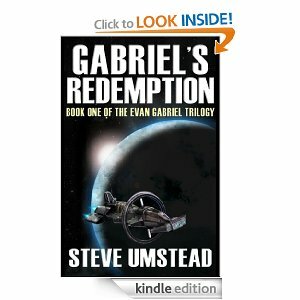 I just finished “Gabriel’s Redemption” by Steve Umstead. Before I talk about the book I want to say a thing or two about the author. I first encountered Steve via his Twitter feed and then through his blog. He is very much a guy I would like to be; a regular guy with a family and a 9 to 5 job who had the dream of becoming an author. Yet unlike so many of us mere wannabes he actually took the plunge and wrote. I am glad he did because the result is one of the better sci-fi books I’ve ever read. As the title indicates “Gabriel’s Revenge” is the story of a disgraced Special Forces soldier who has been plucked from his self-imposed exile and given a chance to redeem himself if he and his team survive. I don’t want to talk too much more about the plot. I want to talk about what I think Umstead does exceptionally well in this book. The book is set in the year 2,176 and Umstead does a great job of creating a fascinating history of the future. The trouble with many sci-fi novels is that the authors create such an elaborate future that it appears all but unrecognizable. Not so with Umstead. He creates a future that is advanced to be sure but at the same time still feels familiar. This is one the best aspects of the book. The other thing the author very well is to do something I do not think I’ve seen before. To be sure military sci-fi is a staple of the genre. Yet what Umstead does I think is unique is to create a sci-fi techno-thriller. He merges the political intrigue and action of a Tom Clancy novel with sci-fi. At times it reminded me very much of the best of Babylon 5 and the movie “Aliens”. “Gabriel’s Redemption” is an outstanding debut by what I hope becomes a widely read author.